AT&T today said Windows Phone 8.1 is now available to the Nokia Lumia 925 and Lumia 520. The update, which can be downloaded and installed over the air, adds Cortana, Action Center, and more Start screen flexibility, among many other enhancements. Nokia today announced that it has begun pushing the Nokia Black system update to more of its Lumia Windows Phone 8 smartphones. Nokia Black offers a wide range of new features, including app folders for the home screen, Nokia Glance 2.0 notifications tool, Bluetooth Low Energy, Nokia Refocus (Lytro-like camera feature), Nokia Beamer improvements, and the Nokia Camera application (combined Nokia Pro Camera and Smart Camera apps). The update is available to the Lumia 1020 and Lumia 925 first, and will be made available to more Lumia models in the coming weeks. Nokia today published a new version of its music application and rebranded the service Nokia MixRadio. MixRadio builds on the Nokia Music service, which lets users create radio stations and stream music to their Lumia smartphones. More than 18 million tracks are available and Nokia has 150 curated radio stations, all of which can be streamed for free. The application was updated with a number of new features including Play Me, a personalized mix inspired by each user's music profile; thumbs up/down ratings to help users refine their profile; and the ability to share mixes through Facebook, Twitter, email, and SMS. Premium features, such as unlimited downloads to devices, require a $3.99 per month subscription. The new app can be downloaded from the Windows Phone Store. AT&T today announced that the Nokia Lumia 925 will be available beginning September 13 for $99 with a two-year contract or $21 with AT&T Next. The 925 uses an aluminum, rather than polycarbonate, frame. Pre-orders begin August 28. 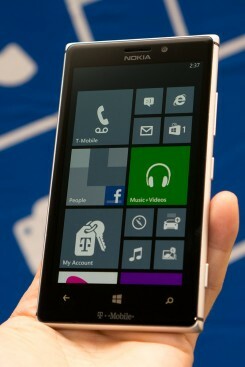 T-Mobile today announced that the Nokia Lumia 925 will be available at T-Mobile stores beginning July 17. It will require a down payment of $49.99 followed by 24 monthly payments of $20. The Lumia 925 runs Windows Phone 8 and boasts an 8-megapixel camera. We spent some time with Nokia's new flagship phone, coming soon to T-Mobile USA. The Lumia 925 displays an evolution of Nokia's industrial design that uses more metal to achieve a thinner, lighter body. Find out how it stacks up against the competition in our hands-on.